There were a few extra pieces of cooked Chicken remaining after dinner on Saturday. After a quick look I realized that I would be able to cut the remaining Chicken into chunks and get about about ¾ cup. Now, that is enough of cooked Chicken to make Cheesy Veggie Chicken. This tasty meal has few ingredients. If I have any cooked Rice in our fridge, I add it, also. Sometimes, chopped Parsley is added into the mix. Prepare this meal and place it in a Microwave safe Bake and Serve dish. My Pyrex comes in handy! Then, into the Microwave it goes. So easy and oh so good! Did I mention quick to prepare? 1. Microwave (1) bag of Frozen Mixed Broccoli & Cauliflower four minutes less than directions on bag. 2. Spray a Microwave safe Bake and Serve dish (about 5” x 10”) with PAM. Place vegetables mixed with bite sized Chicken Chunks in dish. 3. Mix (1) can Healthy Request Cream of Mushroom (condensed) Soup with 1/3 cup milk in a bowl. 4. Spoon Soup Mixture over Chicken & Vegetables. 5. Sprinkle 1- cup Shredded Taco cheese over top. 6. Cover with plastic wrap, leaving open at one corner to vent. 7. Microwave about 8 minutes & 30 seconds, or until hot and bubbly. 8. 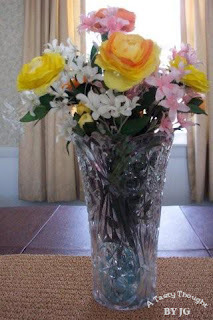 Remove plastic wrap carefully when done. After attending a great lecture at the Museum of Springfield History on Sunday, this meal was so easy to prepare after returning home. The 16 oz. bag of Frozen Vegetables that I used also contained Water Chestnuts and Carrots. Warm beams of sunlight shined through our front bow window. The outdoor thermometer reading was in the 70’s° F. Now, who could resist taking a walk, sitting on the deck reading a book or using the outdoor grill? I couldn’t. 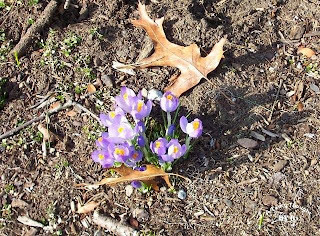 For 4 – 5 days last week that was the picture here in the Pioneer Valley. Ah, Spring arrived! Yes! Then a day of rain, clouds and light jackets replaced the eagerly awaited warm sunny days. We could adjust, because we know that more warm sunny days will return. With the arrival of Spring, Easter is just around the corner. That prompts the planning of Easter Dinner. If you will be preparing this special dinner at home and will be serving Baked Ham, Sassy Raisin Sauce is a great addition served over slices of Baked Ham. This sauce is so yummy and full of Raisins! Preparation is very easy! Now, that is a winning combination. Two years ago when I started blogging, I posted Sassy Raisin Sauce. In addition to pairing it with slices of Baked Ham, we also enjoy it served over Butternut Squash Ravioli. The recipe below is for about 2 ½ Cups and also for 2 Servings. 1. Measure 3 TBS. Cornstarch into a small saucepan. 2. Slowly, stir in 2 Cups Apple Juice. I stir in by ½ cups to dissolve Cornstarch. 3. Add 2 TBS. Butter/Margarine. 4. Add 1 Cup Raisins. 5. Stir constantly while cooking over Medium heat. The sauce will thicken and boil. 7. Serve over desired food. Yummy! It was a few days before St. Patrick’s Day a couple of years ago and I decided to bake an Irish Soda Bread. Buttermilk is one ingredient in that delicious raisin filled bread. Whenever I opened the door to our fridge I saw a partial container of fat free Buttermilk sitting on the top shelf. That container kept reminding me that St. Patrick’s Day was approaching. Yes, I did have recipes for Irish Soda Bread, also called Spotted Dog, but my recipes required either eggs or more than 1 stick of Butter/Margarine. I did not want to use any eggs in the bread, so I was on a Mission. That Mission was to find a new recipe. Google is a wonderful place to learn new info. 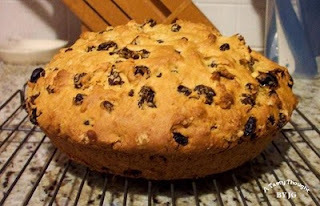 With a click here and a click there after entering key words I quickly found a recipe for an eggless Irish Soda Bread that also contained lots of Raisins. My family really likes Raisins. Carol (from Charli and Me) very graciously shared this recipe and she continues to share it again this year as St. Patrick’s Day approached. Yesterday afternoon the Irish Soda Bread was baked. After it cooled I wrapped it in GladWrap and then in foil. Today, the absolutely scrumptious bread was cut into slices and boy is it good! I have a gas oven and I’ve learned to bake the bread an additional 15 minutes at 375°F. It is longer than the original recipe states. Yesterday in my great haste, I melted the butter/margarine and cooled it like usual when baking. However, this recipe does not call for cooled melted butter. Well, I used it anyway. Much to my great happiness I had a dough that was much easier to handle and not so sticky. The bread is very moisty. This Irish Soda Bread is chuck full of Raisins. Yummy! Below is the recipe that my friend Carol continues to share. Click here to visit her at Charli and Me. Thank you Carol! This is a very yummy bread! In small bowl, pour boiling water over raisins, let stand 5 minutes. In large bowl, sift flour, soda, baking powder, and sugar. Cut in butter until the mixture looks like course crumbs. Drain raisins, stir into flour mixture. Add buttermilk all at once. Stir vigorously with a fork. Shape into ball and flatten ever so slightly. (It should look like a ball) Place on a greased 8 inch pie plate. Bake 15 minutes at 400 degrees, lower heat to 375 degrees, and bake 10-15 more minutes, or until knife comes out clean. Remove from pie plate. Cool one hour. Cut into wedges. Makes 10 servings. ♥ Now this is the most important part of making any Irish bread recipe. When you get the bread into your pan, just prior to baking, take a knife and gently carve a Cross across the top to bless it. Then poke four holes in the bread to let the faeries out. Your bread will turn out perfect every time. For the past four days it has been great to take a glance at our outdoor thermometer in the afternoon. A reading of 58°F is mighty fine! The warm weather brought out the crocuses and the use of our grill. Dinner was quick! Yes! Grilled Haddock in March! Grilled Haddock is easy to prepare and tastes so yummy. A microwaved “baked” potato and a fruit salad rounded out dinner. So good! 1. On a large dish pour about 2 TBS. Olive Oil. 2. Sprinkle a little Paprika (& Thyme, optional) on top. 3. After rinsing a Haddock Fillet in running cold water, place Fillet on the Olive Oil/Paprika (Thyme). 5. Place Fish in a grilling container/basket that has been sprayed with PAM. 7. A 1 lb. piece requires 5 – 7 minutes on each side, depending on grill and thickness of Fillet. 8. Turn Fillet over one time during the grilling process. A grilling container/basket is needed, because the Haddock Fillet will break apart while grilling. We will be enjoying grilled seafood again this week! Another trip to our Big Y Seafood Dept. Have you used your grill? We enjoyed our Grilled Haddock dinner! Every so often the thought of biting into a Bran Muffin that is filled with Raisins seems so good. I don’t mean the muffin sold in quick take-out food areas or a muffin sold in the grocery store. I’m talking about a brown colored Bran Muffin that has been cooling on a rack after being removed from a muffin tin. 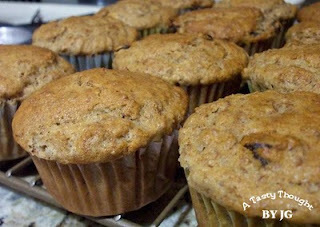 Thinking about it always means I’ll be baking Bran Muffins the next day! Many years ago the recipe (click here for card) below was printed on the All Bran Cereal box. I have changed it a bit. Now, I use Soy Milk, Egg Whites and Olive Oil. I also line my muffin tins with the paper liners. Plain simple Bran Muffins are so good. 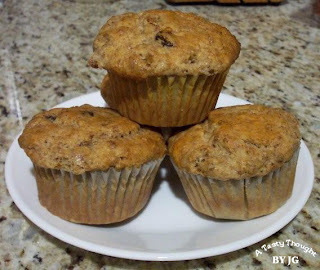 Add the Raisins to make a good muffin great! 2. In another bowl combine dry ingredients and stir. 3. Beat Egg Whites with a fork. 5. Add dry ingredients and raisins. Stir only until combined. 6. Portion batter into 12 muffin cups.